It’s a Tarte kinda day around here thanks to the new Tarte Journey to Natural Beauty Collection that launched as Today’s Special Value on QVC. The set includes six full size products and a bag for $59 at QVC.com and can be purchased as once or sealed into an auto delivery that will get you new seasonal shades in June and November. Let’s take a look at this brilliant little set! So what do you get for your sixty bucks? I’m not going to review all of these pieces since I’ve already swatched and reviewed them in a variety of posts I’ve done already. You can click through and find these reviews above as I’ve embedded links for you to refer back to. I will be reviewing the overvalue of the set and some of my thoughts though. Even after shipping you’re still looking at a rather great deal. Total cost sans tax is $66.91 with tax $72.51. Broken down, not counting the bag, that works out to $12.08 per product. Considering the foundation is $38 and the blush $26 that’s practically the cost of the entire set (sans tax and shipping) so it’s like you’re getting several other items free of charge. One of my favorite parts about this set was the new Amazonian Lipstick as this has a buttery smooth texture as I mentioned in my original review and a nice pigment. The second best part would be the new Lights, Camera, Flashes! Mascara, again I already reviewed this, but just a brief re-mention I’m really loving the volume and length this gives my lashes. Those addicted to owning every single shade of Amazonian Blushes will be happy to add Fearless to your collection. Tarte calls this is a warmer pink but I got more of a cooler pink from it. It kinda has a little touch of peach to it with fine golden shimmer. It’s quite pretty. I tried comparing it to other shades in my stash but didn’t really see any dupes for it that I own. The bag is another really great extra here as it is a huge overlapping bag that is a great for traveling. You can hold a TON of products in here. I purposely included the measurements for it above so you can see how large it is. Opened up it’s about the size of a standard piece of paper. I mentioned in a prior post I am slightly intimidated by QVC Today’s Special Value Sets that include foundation. Thankfully, if you do go into auto ship on this set, it only includes two more shipments. That’s NOT too bad. I’ve sealed myself into some sets that includes four or more sets so I was getting so MUCH powder or foundation over the course of the year, it was absurd to say the least. It is something to take into consideration if you do decide to head into an auto delivery purchase though. It basically means you’ll get two more sets like this one with a new lipstick shade and a new blush shade in June and November for the same low cost of $59. You can, of course, purchase the set as a one time value at $59 as well. Auto delivery is entirely optional and you can cancel it at any time. One other thing that didn’t work for me with this set was the Brow Pencil. I was going to head into a purchase of the set because I adore the lipstick and the blush. I finally decided I wouldn’t but this morning I decided I would. I was going to just gift the brow pencils to a friend I know who uses them. I couldn’t resist as I want the upcoming lipstick and blush shades (particularly the lipstick as I’ve fallen in love with the formula). If you don’t use a brow pencil either you might want to consider it as swap material on makeup forums or perhaps something you can gift away as for myself, personally, it’s a little bit of a waste. Overall, this set takes things down to basics. No real emphasis on eyes with heavy shadow but more of a natural finish using mascara and a brow pencil. Simple natural cheeks and lips add to the overall natural look! I like the simplicity here and enjoy a cheeks, lips, and face set plus hey, you also got a new mascara to create dramatic lashes with for a doll-like effect to complete the look. The value, as always with these sets, is tremendous. I’d love to hear your thoughts and whether or not you want! Ugh. I just talked myself out of buying this (and the new Tarte concealer, which won’t ship until the middle of next month), but you’re making me want it again…. Love the Bag – Love the Brush – Love the lipstick. Don’t need anything else. So I think I’ll sit this one out. never leave home without hehe. I’m not a pro by any means but I don’t feel comfortable without some concealer and a little blush at the least. I honestly don’t need a buncha eyeshadow/etc on the weekends but a little cheek stain/concealer goes a long way hehe so def wouldn’t go without ;-D if I was younger maybe but now dark circles/puffiness needs concealing! 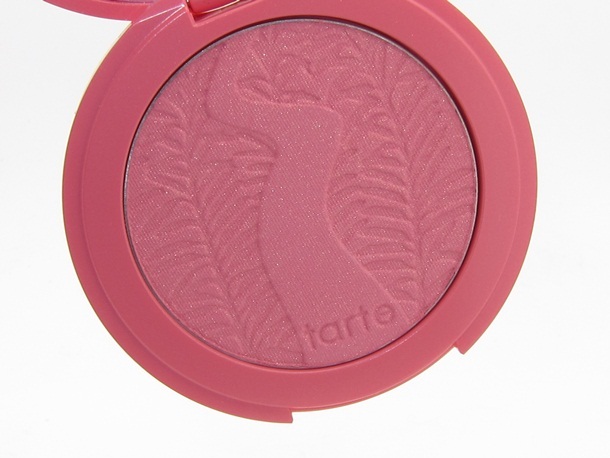 I love Tarte – they do most everything right! I so want this set, but wish they had it on EasyPay! I bought the auto delivery, but I was thinking the brow pencil/concealer would be a universal shade. I’m probably somewhere between a light and a medium, although those shades look very yellow, so I ordered the light a/d because that shade always seems to sell out first. However, the brow pencil will be waaay too light because they don’t let you choose the brow pencil. Fair/light foundation gets the fair/light pencil, medium/tan gets the medium/tan pencil, which I would prefer, and deep gets the deep pencil. I have ultra dark hair and brown brow pencils look very strange on me. I love the blush, brush, lipstick and bag, so technically that’s already the value of the TSV, but I’m debating canceling my order. Maybe I’ll get the first delivery and see how it works out. Thanks muse! Although I’d hate eating the shipping cost, it’s worth it if I don’t end up liking it. I hear I can change the shade on my next a/d though, so I may get the medium for that and mix the foundations and use that brow pencil instead. i do too…:-/ I’ve heard that as well! I’ve never tried it but I people seem to have successfully changed mid-AD ;-D Good Luck! Passing on this set because AGAIN, Tarte doesn’t include any neutral or cool-toned foundation colors. Ivory is a great choice for me because it is more neutral, but Tarte said they will never offer it at QVC. The pink blush is WAY too pink and I don’t necessarily think it’s a good match for the lipstick. Not impressed with a brow pencil that claims to be universal color. I’m not a fan of Tarte brushes because they are far surpassed in quality compared to I.T. Cosmetics, Sigma and Real Techniques. I really hate to be a Debbie Downers as I love Tarte but I have passed on almost all their kits lately because I think FOR ME they miss the mark. Oh Muse, I hauled this and I loves it! Thank you for the heads up. So excited for the new shades too! P.S. did you hear Estée Lauder is coming out with a new Mad Men collection!!!! Squeeeeeee! 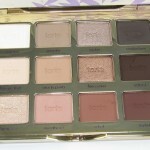 Did you see the Tarte Exotic Eyes Amazonian Clay 5-in-1 Shadow Palette? It looks like UD Naked Basics Palette! 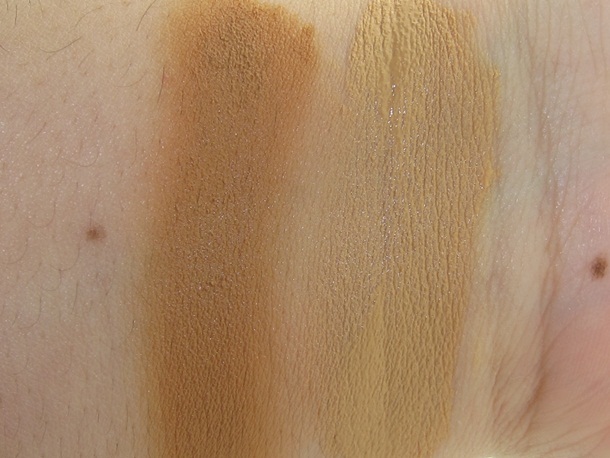 I need to see swatches!! I did ;-D curious ’bout that! thanks catherine I actually already posted the info early this morning 🙂 https://www.musingsofamuse.com/2013/02/tarte-journey-to-natural-beauty-collection-future-shade-shipments.html but thanks for the info! Ops Sorry Muse. Didn’t see that on this thread. Thanks for all you do on your blog. Love coming here to see what new products you are reviewing. Wish the Pantone 2013 products would hurry and show up on Sephora. Can’t wait to see them. Have a wonderful evening!! Love everything but the silly brow pencil thing! 🙁 I fill in my brows, but im a pale natural brunette. 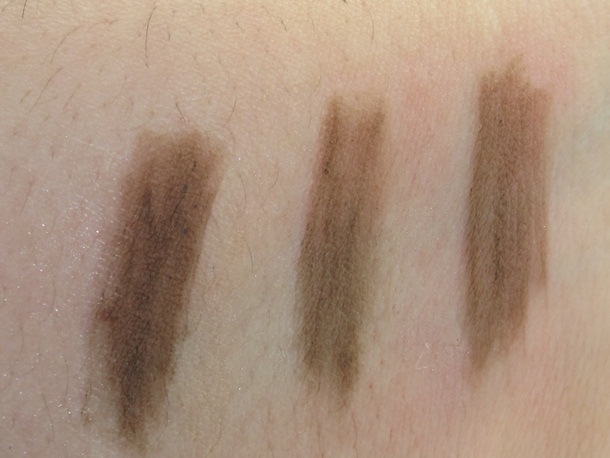 so getting the light brow pencil would be pointless, but even buying the dark one separately would be too because of the highlight thing being way too dark. Bad product design Tarte! i am SOOO HAPPY i got this kit! it was totally worth it!!! the foundation turned out to be perfect for the matte look, just a little goes a long way so use carefully. i havent tried it with the brush just my fingers and it still looks great! 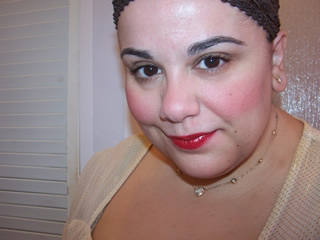 the lippie – beautiful rosy pink which on my tan skin looks just like MLBB. the mascara – i think it lengthens more than the original BUT i dont think it curls as well and it doesnt make ur lashes as full. thats just my opinion. the blush is a bright pink so again u need to use a very light hand. the bag is adorable as is the brush – there isn’t anything I don’t like in this kit!! I ordered, but I’m a little worried that the foundation won’t match and that Ivory would have been a better pick for me. Even if it doesn’t match, I can give it to my sister and keep the mascara, blush, and lipstick for myself! I’m hopeful abut the brow product… hopefully it works better for me! julia how’d you make out? I want to buy this kit just because of that gorgeous lipstick but I just can’t. Their foundation colours just don’t work for me. I’m olive toned and lighter skinned but their foundations are even too yellow for me. I know they have a great return policy, but I’m stuck with a foundation I don’t use/want because I didn’t feel like spending another $10 to return it. (returned the previous one for being way to orange and dark – Medium was recommended for me but I looked like an oompa loompa). Are these brow pencils replacing their current wax pencils? I love their current ones, though I wish they’d offer a grey-toned brown like those Asian companies for people with black hair. Brown always looks so weird with black brows and black is way too harsh. Just wondering, is fearless similar to Tarte’s adored by any chance??? I’m contemplating which to buy for nc45 skin!! If someone could help that would be much appreciated!!! I think adored is much lighter. Fearless would be a better match for your skin tone. I’m NC42 so I understand your pain when it comes to pink blushes. Fearless is also a warmer pink which is good if you have warmer undertones.